For the downstream communities of the high mountains of Quimsacocha, water is sacred. So when the giant Canadian company set their eyes to mine their land for gold and copper, 30-year-old Bolivar and 73-year-old Isaura were not happy. Isaura and Bolivar rely on water for their livelihood. Isaura owns four cows and Bolivar is in charge of the community’s water system. For them, water is life, and mining will jeopardize the future of their communities. 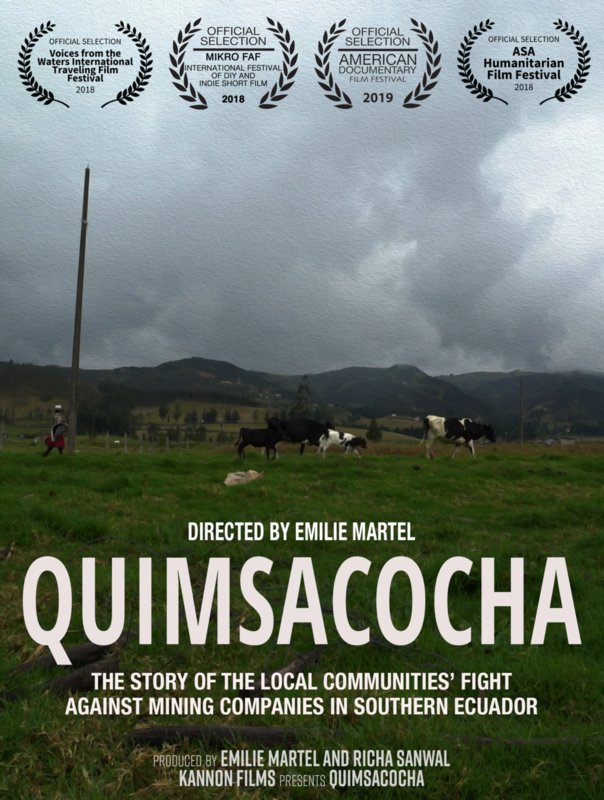 Quimsacocha takes an honest look at these indigenous communities, their cultural traditions, and their lives in this picturesque landscape of the Western Andes Mountains in southern Ecuador. Emilie is a visual storyteller, director and producer. She has produced short web content for organizations worldwide, such as The Guardian, Univision, Great Big Story, Newsweek and more. She has worked extensively in New York City, Ottawa and Ecuador. Alongside Quimsacocha, she is directing and co-producing the feature-length documentary Uproot about endangered primates in Ecuador’s Yasuni National Park. She is also directing and co-producing a french documentary series called “Our culture, our stories” about the Metis People in Canada. Richa specializes in documentary filmmaking and broadcast journalism. She was a broadcast journalist/producer for New Delhi Television (NDTV) in New Delhi. After working there for almost 3 years, she applied for a Masters program at New York University (NYU), majoring in TV news and documentary filmmaking. Her documentary on skin color discrimination in India, In All Fairness, screened at various film festivals including the America's largest documentary film festival - DOC NYC at IFC centre in New York City. She has also produced and reported on stories for Al Jazeera America, Yahoo!, ABC, Newsweek in New York. Richa is now based in Mumbai and freelancing as a video journalist in the maximum city.